Gambrel Barn is Verona, Missouri has large, mature trees at the front of the property. This bride and groom told me how much they wanted some wedding portraits once it got dark and I knew exactly where I wanted to set up the photos. I love the way her wedding dress from David's Bridal is glowing in this photograph. When setting up this image, I wanted to create the sense of movement. My goal when photographing the bride and groom is to avoid the static, posed image. I want the connection between them to be completely nature. For this photo, I asked the bride to grab the train of her dress and lean towards her husband for a kiss. I love being able to see both the profiles of this couple. This property has lost of options when it comes to taking your wedding photos. 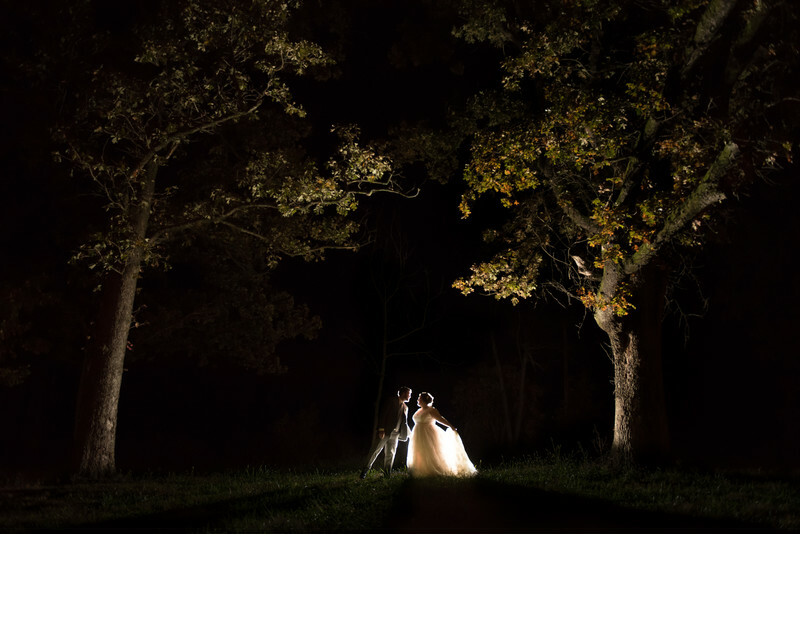 Thankfully, this couple was more than happy to step out from their reception to grab some wedding photos in the dark. It was a quiet time to reflect on how fast their wedding day had gone. Location: 18015 Lawrence 1125, Verona, MO 65769.